Social Psychology 11 Edition Reflecting your students and their world. How many of the students in your Social Psychology course are Psychology majors? Business? Sociology? Education? 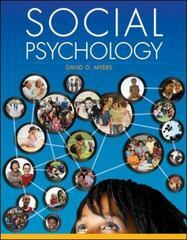 In the 11th edition of Social Psychology, David Myers once again weaves an inviting and compelling narrative that speaks to ALL of your students regardless of background or intended major. And with Connect Social Psychology and LearnSmart, students are able to create a personalized learning plan helping them be more efficient and effective learners. With LearnSmart, students know what they know and master what they don't know and faculty are able to move to more in-depth classroom discussions. Through examples and applications as well as marginal quotations from across the breadth of the liberal arts and sciences, Myers draws students into the field of social psychology. At the same time, Myers is also in tune with the ever-changing state of social psychology research. Research Close-Up and Inside Story features throughout the book provide deeper exposure to key research and researchers. Marginal quotations, examples and applications throughout each chapter, and the concluding "Applying Social Psychology" chapters all ensure that regardless of your students' interests and future plans, Social Psychology will engage them. This 11th edition also features the contributions of Jean Twenge, author of Generation Me and The Narcissism Epidemic, further bolstering the direct connection to today's students.